Early spring means unsettled weather in the Mid-Atlantic. One day it can be 45 degrees and pouring rain while the next it’s 75 with bright sunshine. This is the time of year when the Bay creates its own conditions. It’s not unusual to see 30-knot winds over Kent Narrows while it’s dish calm with blue skies off Poplar Island. 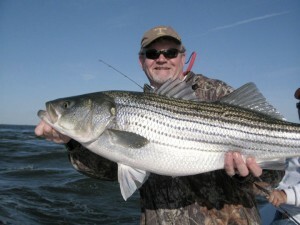 Savvy fishermen look forward to the unsettled weather of early spring because it brings the best fishing of the year. 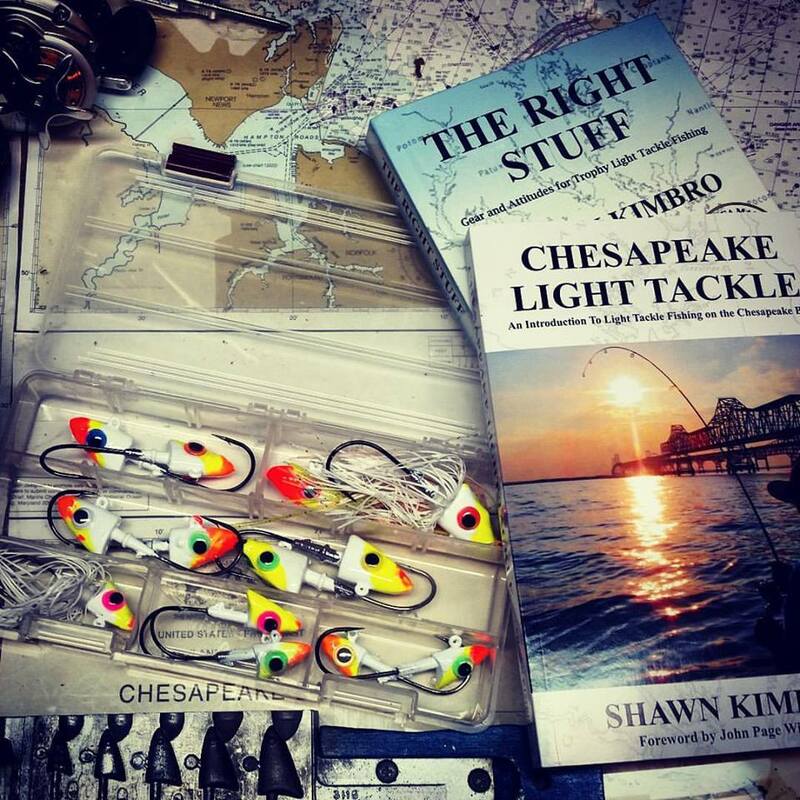 Light tackle anglers become storm chasers, but we’re looking for something other than rain falling from the Chesapeake skies. Our April showers are gannet storms. Some people live their entire lives around the Chesapeake and never see a northern gannet. They only visit our region for a few weeks as they make their way north to the summer breeding grounds on the islands around Nova Scotia. They may be the most spectacular of all the sea birds because of their beauty and their dramatic headlong plunges from high in the sky. Adult gannets have dazzling white plumage except for narrow gray circles around their eyes and jet-black tapering wingtips. Their necks have a yellowish gold tinge. Their eyes are icy-blue and their bills are blue to gray-blue. If you watched the Super Bowl this year, you may have noticed a commercial featuring gannets. Called “The Isle of Flightless Birds,” the advertiser completely missed the point when the “Live Borderless” commercial hinted that these graceful creatures are wary of flight. The sight of diving gannets strikes excitement in the hearts of fishermen because it means there’s bait – and often big fish – nearby. 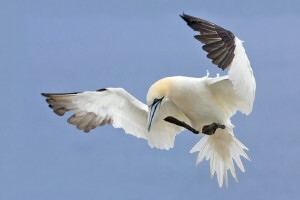 Gannets are adept hunters with amazing eyesight that quickly flock together where food is plentiful. When big migratory striped bass are in the Bay, gannets are sure to be overhead. As the stripers round up schools of bait and force them close to the surface, gannets begin to circle in formation. As if on command, they dive by the dozens, striking the surface like missiles and creating explosive plumes of white water. More birds hover overhead, waiting their turns for a clear shot at the fish. Additional gannets swarm in, swelling the size of the flock to more than a thousand. They repeatedly dive, resurface, and then fly back up again in an astonishing whirlwind of black, white, and gold feathers. All the excitement causes the fish to become even more frenzied as they compete with the diving birds for the bait. 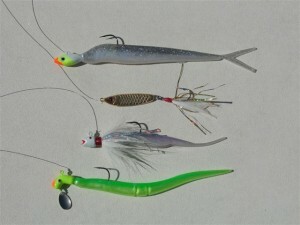 It’s a spectacle most people will never see, and a light tackle fisherman’s dream come true. Although their numbers were formally in decline, there are more gannets in the Mid-Atlantic this spring than ever before. John Page Williams, Senior Naturalist for the Chesapeake Bay Foundation, recently relayed reports of thousands staging in Virginia. He forwarded a message from Bryan Watts and Mitchell Byrd of the Center for Conservation Biology who have observed staging gannets along the bayside of the Eastern Shore. Birds have been observed in the past during the second half of March while conducting the annual bald eagle survey. The number of individuals has typically been 4-5,000. They have generally congregated somewhere between Watts Island and Pocomoke Sound and have been observed in dense aggregations resting on the water with only a small portion foraging. On Saturday 20 March, 2010 while conducting aerial surveys Watts and Byrd observed a large congregation much farther south near the mouth of Hungars Creek in Northampton County. The group was estimated to contain 20,000 individuals and was spread out over several square kilometers. This represents a significant portion of the population believed to occur within the western Atlantic. With all these gannets around, you’d think it would be a good Spring for finding migratory fish in the open Bay. Unfortunately, it’s been tough. Running and gunning in March and April is always a risky proposition. I take more “skunks” in the spring than any other time. Adding insult to injury are the trollers who steadily pick off fish by playing the odds with heavy rods and multiple lines. 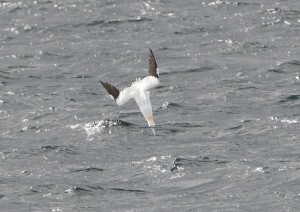 But the miles of searching are well worth the risk because of the rare reward of popping up on a gannet storm. You might only land one or two before the frenzy ends, but you could easily catch the fish of a lifetime. In the past two weeks I’ve been trading trips with my Kent Island neighbor Mark, alternating between his Parker 2520 and my Judge 27CC. 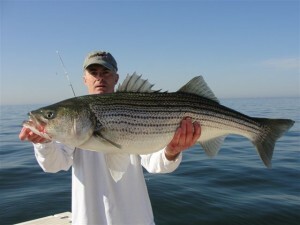 We’ve made a lot of long runs but only found fish once or twice, both times well south of Kent Island. On one epic voyage I ran 95 miles with nothing more to show than some interesting shots of bait fish on my Lowrance Structurescan. Mark has managed a few trips without me and had better luck. He fishes out of Queen Anne’s marina near Romancoke, and has been casting relatively close to home. Mark makes all his own jigs and has recently experimented with some lesser-known styles that he has painted with trademarked CLT alternating color patterns. Big migrating fish that are feeding-up before and after the spawn usually aren’t too picky about what they’ll hit, but Mark’s lures look so nice it’s hard to see how they could resist anytime. Mark’s wife Eva is the real fisherman in their family. She regularly out-fishes everyone on the boat by casting a gold spoon to which she’s attached a barbless 7/0 hook hand-dressed with white bucktail. 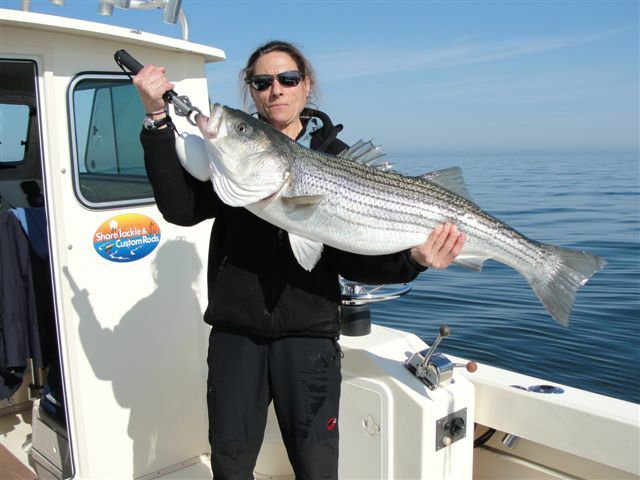 Last spring she fought a 45 pounder to the side of the boat with that rig, and she’s right back at it this year catching trophy stripers in the mid-40 inch range. Here’s some pictures of fish they caught Friday morning. As you can see, they had them all to themselves with not another boat in sight. Mark reports that the fish have been rounding up peanut bunker over hard bottoms in 12 to 20 foot depths. Sometimes he’s even seeing big fish feeding on the surface. That has me hoping to get out there soon with a top-water plug. Water temperatures are just approaching 50 degrees in the open-bay but have now warmed to spawning temps in the upper reaches of the rivers. Migratory fish are on the move. I’m not yet ready to call this a good Spring, but the coming two weeks should tell the tale. I haven’t checked, but I hope the weatherman is calling for storms. 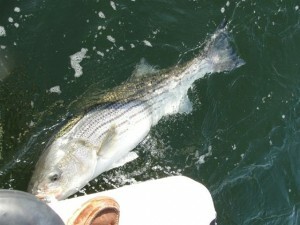 Here’s to unsettled weather, diving birds and trophy rockfish! Enjoyed the aticle Shawn. They were active well south of KI Thursday, but you nailed it when you said 1-2 fish and then the show was over – and I had to head back. Great read .This past Sunday there were Gannets in close reach of the BB area and not deep,most I have ever seen since chasing them. Lots of casting but well worth it to hook into one of these beautiful fish on LT.
Another great read! Thanks to taking the time to write and share. That one shot of the gannet about to impact the water is awesome! As an avid birder, I don’t know which parts of the story I enjoyed more, the parts about the gannets or the parts about the rockfish. My wife and first mate introduced me to birding (and I introduced her to fishing), so I ran off a copy of this story for her to read. I’ve seen plenty of swarming gulls over breakers, but never one of those gannet storms, it must truly be a sight to behold. If I ever get the pleasure, I’ll probably start at it for a while until someone tells me “hey Don, snap out of it! There are fish to catch!” Thanks again! Nice work, Der Mark. Look forward to fishing again sometime. You and your brothers always have an open invitation on “der Fischalder.” However, with “Thunder Road” on the block, I may just join you fellers from now on! Thanks for another great article. I enjoy the information and photographs of the bay as much as your fishing reports. Man sieht sich beim Fischen!